I was once taught that the reason we stand to hear the Gospel is because people were so excited to hear it that they would stand and lean in to hear the word. As I was reading this text, I could feel the desire to lean back, to back away from the words here. This is the hard stuff. This is the stuff we would rather not talk about or think about. Most of us would rather God’s grace end with us, rather rest in God’s love and forgiveness as given to each of us individually than think about God’s radical forgiveness extending itself towards everyone – and us being the vehicle of that extension. It is easier to just accept God’s love – to have faith that God loves me, and to ignore the rest of it. I was talking to a friend about my faith the other day, sharing the good news that we are all forgiven of our sins – there is no tally board, there are no sins that are worse than others and that each and every one of us is equally loved and forgiven by God. I was sharing with him the freedom of salvation. As this friend had previously told me he is a Christian, I was expecting agreement, assent, some kind of response of joy at a God who loves and forgives so deeply that there is nothing that we can do that will cause God to turn God’s metaphorical back on us. What I got was frustration and anger. You have heard it said “an eye for an eye and a tooth for a tooth,” but I say to you preemptively strike an evildoer. If you think that your enemy is even contemplating taking your eye, take theirs. If you feel your tooth being threatened, take the teeth of the one threatening you. Or someone associated with the person you think might want to take your tooth. And if anyone wants to sue you and take your coat, sue them for their coat and cloak as well, and if anyone forces you to go one mile, sit down and complain about it. Ignore everyone who begs from you, and charge interest to anyone who wants to borrow from you. We like the idea of Jesus, we like feeling loved and warm and fuzzy, we like knowing that I am forgiven for my sins, but we struggle with the idea that, um, so is everyone else. That the rain does fall on the quick and the dead alike. We all too often stop at the Jesus loves you stuff and forget that um, like, Jesus actually asks us to do stuff. Stuff that is uncomfortable. Stuff that is hard. Stuff that goes against the cultural narrative. To risk using a lot of Lutheran jargon, we are saved by grace through faith in Jesus Christ. Or God loves us, forgives us, cares for us no matter who we are or what we have done or left undone. We are called to respond to this gift through acts of radical love, peace and justice. We can choose not to. God will love us all the same. We have a choice: cheap grace or costly grace. Accept God’s love and then go about our lives (making the price Christ paid on the cross cheap), or let God’s love go to work in us, disturb us and transform us into people who can’t help but turn the other cheek and love our enemies (making the price Christ paid on the cross look like it means something to us, making it costly). Which one will transform the world? Which choice is a choice for the kingdom of God and which is a choice for the kingdom of humankind? What happens when we sit back and rest in God’s love without responding? When we allow our desire for vengeance, our particular desire for preemptive vengeance or vengeance based on mere suspicion to become the law of the land? Did y’all hear about what happened in Florida this past week? A jury was hung on whether a man who killed an unarmed man in public was guilty or not because the shooter felt threatened. How many young people have died because fear (fear likely based more in skin color than anything else) was enough of a justification to kill? We know the big stories – Jordan Davis, 17 years old killed because he was playing his music too loud. Trayvon Martin, killed for being in the wrong color in the wrong part of town. There are other stories, like that of 13 year old Darius Simmons of Miluakee, killed while he was taking out the garbage for his mom. Shot in front of his mother by a neighbor who suspected his new neighbor of stealing from him. How many people are killed every year because of something that person might have done, might have thought of doing, or the cultural perception of that person. On the national front, we have more people in jail in the United States than any totalitarian regime in human history. Yup, that’s right. And more people in jail than in high school. And a higher incarceration rate than any other country, which is disproportionately higher for people of color than white people. We are so desperate to ensure our kind of justice is done, we are willing to experiment with drug cocktails that we aren’t sure will work on death row prisoners — we torture before, even while we kill. When faced with dealing with threats from people outside of our borders, we strike with swift preemptive force. We have drones out there striking people who might be terrorists, drones striking people using cell phones that have been used by suspected terrorists. This is the cultural norm. We are told that that turn the other cheek and love your enemy stuff is nice and all, but we can’t actually live like that. It isn’t practical in the real world. But what about God is practical? What about radically loving those who are left out, left over and broken, who are on the sidelines of society is practical?! We can continue to go along with the eye for an eye, love your friends or your nation and forget everyone else way of doing things. But God calls us to more. Christ calls us to more. We were created for more than this. We were created in God’s image, in the image of a being who loved deeply, radically, without consideration for a person’s past and only hope for that person’s future. In the face of violence, we are called to stand strong. Jesus’ call here is not to cower, nor is it to accept violence perpetrated against us or others. It is a call to respond with strength, with self-love and love for the perpetrator – to not hit back but to also make it difficult to be hit again. 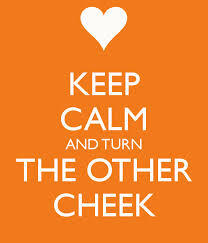 The turning of the cheek is not an act of weakness, but an act of defiance. You hit me once, but to hit me again, to hit me on the other cheek would be to cross cultural norms that would make you unclean, dirty, wrong. Let me say this again, Jesus is not encouraging anyone to just sit there and take it, to accept violence in order to bring about peace. He is calling us to force the perpetrator to rethink their actions, to do something unexpected, to change the game. Jesus calls on us to stand our ground, but God is our ground. When Christians stand their ground we are not called to ground ourselves in fear disguised as bravery or vengeance, but in God’s radical love. Jesus is calling us to get out of our cozy, comfortable neighborhoods, our communities of people who look, think and act like us into the discomfort of the unknown and the enemy. ‘Cause, let’s face it, some people we consider our enemies for an actual reason, but most of the people (nations, religions, ethnicities, genders, whatever) we don’t like or we fear, we just don’t know. This is not always easy. This is not always fun. But this is the work to which we are called in Christ Jesus. We are called to live differently. We are called to go against the norm. We are called to respond to God’s loving grace by getting as close as we can to acting out the radical love that is God, that is God’s gift to us. We are God’s agents of change and radical love. This call to love our enemies and pray for those who persecute is, to turn the other cheek, to give not only our coat but our cloak as well is so much bigger than not being a jerk, bigger than being nice. Being nice is comparatively easy. This call is a call to ask questions, to challenge, to call out for change when we see the bodies that are being left on the sidelines because of hunger, homelessness, war, to be a voice for the voiceless, to live a life that looks more like we’re working for the kingdom of God than the kingdom of humankind. You are loved. You are forgiven. You don’t have to earn it. It is a gift. Now what will you do with it? What will be the ground upon which you stand?